We could go on all day with interesting facts about the Sunshine State: Recently, Florida surpassed New York State to become the third most populous state in the U.S. And St. Augustine is not really the oldest U.S city, as some say, but it is the oldest European settlement in North America (it is also where Ponce de Leon claimed to find the fountain of youth, a site that still exists as a tourist attraction though few, if any, claim that it worked for them). Here we will provide you with 15 fun facts about Florida. Some of these are little more than good trivia questions for a friendly game night with your next door neighbors. But some of them are places you can see for yourself. So it gets the most sun of any state, right? Five other states, Arizona, California, Nevada, New Mexico and Texas, catch more sun than Florida, according to the National Weather Service. But it has to be added that Florida’s sunshine is strong. The reasons are the state is in the subtropics, so rays from the sun arrive at a sharp angle. Alligators and crocodiles may look alike to most of us humans, and they are both reptiles, but they are distinctly different. Crocs, to mention one difference, can grow to almost twice the size of gators (crocs can weigh 2,000 pounds). If you really want to get nit-picking, their snouts are also different. But there’s only one place in the world where they get along swimmingly. That’s the Florida Everglades. 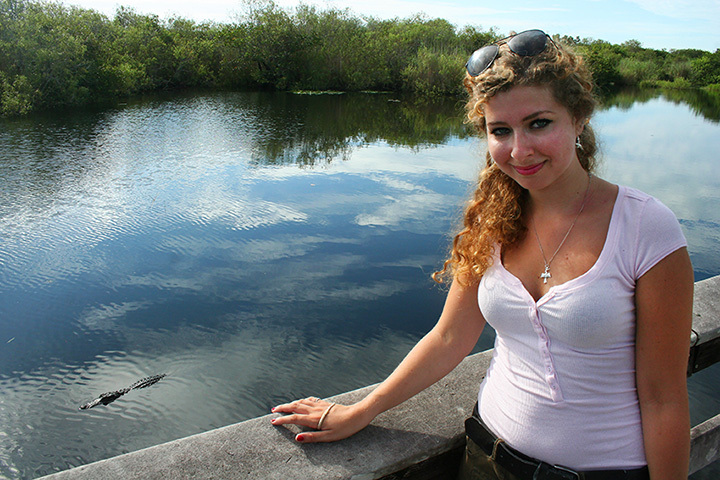 If you want to see them, most trips to the Everglades turn up at least one or two. Florida has more golf courses than any other state, some 1,300 of them, according to Paradise Golf Academy. But that was not enough a few years ago when a couple of state legislators introduced a bill to require the state Division of Recreation and Parks to hire Nicklaus Design to build courses on state parks in every region of the state. That would have created a Jack Nicklaus Golf Trail in Florida. Environmental groups raised objections. The general public did not think much of the idea, either. Some newspaper columnists called it "the worst idea ever" to come out of the legislature. Even Arnold Palmer's design company said there were better alternatives for new golf course designs. The bills were later withdrawn. Florida is known for oranges. And citrus. But watermelon? Surprise. The state is usually the top producer here, according to the USDA Economic Research Service. Texas and California in some years bump the Sunshine State. The fruit thrives during Florida’s fall and early winter months, and again in the spring. Rainy seasons are detrimental to watermelons. In the U.S., annual per capita consumption is about 14 pounds per person. The largest producer in the world is not the U.S., but China. Turkey is second. The U.S comes in at No. 5 worldwide. Watermelons are said to have originated in Africa, and are named such because they are 92 percent water. 5. Thank goodness for AC! One of Florida’s true heroes was not an explorer, a solider, a titan of industry or an airline pilot (ala Sully). He was Dr. John Gorrie who is credited for inventing air conditioning while living in Apalachicola, a Florida port city that gets as hot as anywhere in the summer. The positive impact of air conditioning on living anywhere in the southern part of this country, as well as Florida, has been well-documented in many books. As a researcher, Gorrie theorized that bad air caused diseases. While testing his theories, he discovered the basic elements of air conditioning in the mid-1800s. There are various memorials to him, schools and parks named after him, and a museum in his honor in Apalachicola. Why anyone would want this title is difficult to understand. But a few years ago, a Tampa fire department leader told a crowd the city was the lightning capital of the country. But believe it or not, Orlando and Miami have in the past made similar claims. Even NASA’s Kennedy Space Center got into the act. And Ocala, Orlando’s tiny neighbor? A story has it that Disney wanted to build his park in Ocala, about 90 miles from Orlando, but lightning strikes there deterred him. National weather officials say the “capital” is really what is called “Lightning Alley.” That’s an area from Tampa to Orlando, where there are as many as 50 strikes for every square mile. By comparison, the Empire State Building in New York City is only struck by lightning about two dozen times a year. The Bald Cypress known as the “Senator” was said to be 3,500 years old, dating back to almost Biblical days. It was the largest tree east of the Mississippi. It was well over 100 feet tall and 35 feet at its widest. A hurricane in 1925 damaged its top and shortened it about one third. An arsonist was convicted of burning it down in 2012. She was heard bragging that she burned down a tree older than Jesus. Today, county commissioners have put up a memorial created from its charred ashes, which is all that’s left. You can see it at Seminole County’s Big Tree Park in Longwood. It was only partly humorous when in 1982 the Florida Keys declared war on the U.S. The move came after the federal government set up a roadblock south of Florida City to search cars for drugs and illegal immigrants. That led to tourist cancellations to avoid traffic jams. So then Mayor Dennis Wardlow declared the creation of “The Conch Republic.” He also asked for $1 billion in federal aid. The Conch Republic has as its stated Foreign Policy, "The Mitigation of World Tension through the Exercise of Humor." If there was a slowdown in tourism, it didn’t last long. Tourists today continue to regularly visit the Keys. The city of Sarasota is known primarily for its circus ancestry but it’s also the only Amish beach resort in the U.S. Pinecraft is a small neighborhood community with about 3,000 Amish and Mennonites. It’s a highly popular winter home for religious believers more often found in the Midwestern and eastern states like Pennsylvania. The Amish are known for their embrace of the simpler life. And here, buggies powered by the sun and three-wheeled bicycles are more common than cars. Most people seen here are Amish who, snow-bird-like, make a winter journey to Florida. Everyone’s heard of Walt Disney World in Orlando. Not everyone has been there, but the city’s most-visited tourist attraction draws people who are very reluctant to leave. These may include those who are alive, but what about those who are no longer with us? Disney “cast members” have long been discovering urns of human ashes in lakes and particularly at the “Haunted Mansion” attraction, a long-time favorite. If you’ve ever quenched your thirst with Gatorade, you might’ve known it came from Florida. Specifically, the University of Florida College of Medicine. A team of scientists there headed by Robert Cade invented the drink when then-Gators football head coach asked for a team drink to replace body fluids during intense physical efforts. Ten players on team were guinea pigs for the first test. The team later credited the drink with their win over arch-rivals Georgia Tech. Georgia Tech’s coach said: “We didn’t have Gatorade. That made the difference.” Today, Gatorade is manufactured by PepsiCo and distributed in 80 countries. When you think of large cities, it’s New York, Los Angeles and Chicago that come to mind. But Jacksonville? Yes, the largest city by area in the contiguous United States. Jax covers almost 750 square miles. The reason is that the city government consolidated in 1968, placing dozens of smaller cities into the Jacksonville metro area. Overall, in terms of population, Jacksonville is the fourth largest city in Florida. The “First Coast” was named after Andrew Jackson, the first military governor of Florida who later became the seventh president of the U.S.
Sure, Kitty Hawk was where the Wright Brothers taught everyone that people could fly. But the world’s first regularly-scheduled flights in 1913 involved the short distance from Tampa to St. Petersburg. The Airboat Line. The flight covered 18 miles and cost $400. It took 23 minutes, which was 11 hours less than rail travel. Flights seldom rose more than five feet above the water. The private service lacking any government subsidies lasted only three months without government subsidies. Key West is the hottest city in the U.S…or it’s not. According to the National Climatic Data Center, the warmest parts of the country are the Florida Keys, where the annual average temperature is about 77.7 degrees. Southeast Florida, including Miami, is also warm at 75.4 degrees. But findings are based on average year-round temperature. Some argue a better measurement, however, may be a city’s average high temperature in July, the hottest month of the year. By this measurement, Lake Havasu City, Arizona, turns out hottest, according to Fun Trivia. The average July daily temperature is above 100, or 111 degrees. Since Florida has all these oddities, why not also a Bigfoot version: eight feet tall, hairy and smelly. The Sunshine State’s version is the Skunk Ape. Sightings have been all over. The guy seems to particularly prefer swamps. He’s another Bigfoot in size, maybe seven or eight feet tall. Walks on two legs. Covered with thick dark fur. He gets his name in part because of his smell, which is not good. He’s been seen often but has so far been elusive. Some observers claim he’s a relative of Bigfoot…maybe his brother?